SEOUL, South Korea South Korea banned activists from launching anti-Pyongyang leaflets across the heavily fortified border into North Korea on Monday in an unusual move to halt their propaganda campaign. North Korea's military said last week it would strike if South Korean activists carried out their plan to fly balloons carrying the leaflets across the border. South Korea pledged to retaliate if it was attacked. 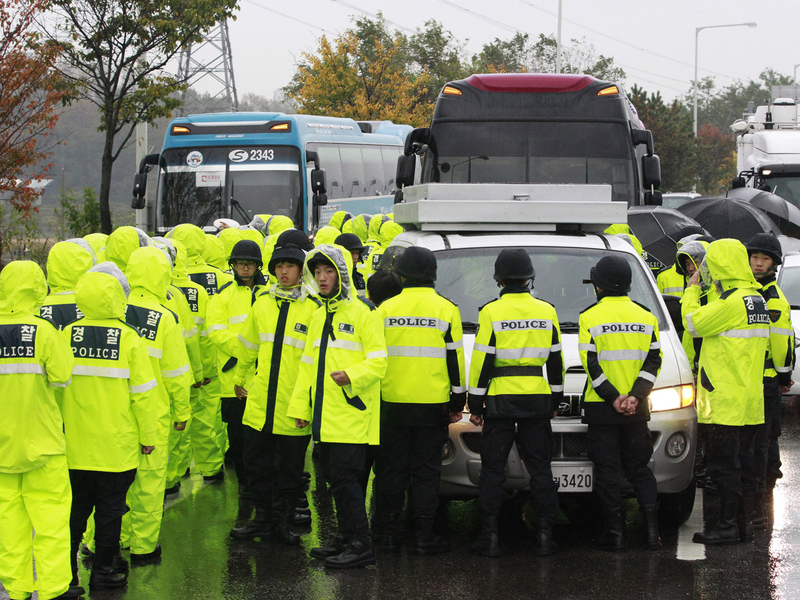 Hundreds of South Korean police were mobilized to seal off roads to prevent activists and other people from entering a launch site near the border, police said. Before Monday's action, the government had implored activists to stop their campaign, but it cited freedom of speech in not making further attempts to intervene. Residents near the launch site were also asked to evacuate to underground bunkers, according to local official Kim Jin-a. North Korea has regularly issued similar threats without following through. But Seoul's Yonhap news agency reported Monday the entry ban was imposed as South Korea detected North Korea uncovering artillery muzzle covers and deploying troops at artillery fire positions in possible preparation for attack. Yonhap cited no source for the information. South Korea's Defense Ministry said it couldn't confirm the report but said its troops have been placed on a high alert to cope with any potential North Korean aggression. Dozens of activists, mostly North Korean defectors, planned to send about 200,000 leaflets critical of North Korea's young leader Kim Jong Un and his country's nuclear weapons program. Lead activist Park Sang-hak said the entry ban is tantamount to yielding to Pyongyang's threat and his group will try to find another place to float leaflets. "It's surrender. It's clearly surrender," he said. Ties between the rival Koreas were badly strained after two deadly attacks blamed on North Korea killed 50 South Koreans in 2010. The Korean Peninsula officially remains at war because an armed conflict in the 1950s ended with an armistice, not a peace treaty.